You can lead a cat to water… but you can’t make it drink. Sound familiar? This can be a really tricky business for a lot of cats – it’s something of a Goldilocks approach in finding out what suits yours. As cats are very susceptible to water infections, struvite stones and various kidney related problems that stem from dehydration – making sure your cat is drinking enough is vital in ensuring that they live a long, happy (and lower vet-bill related) life. Try placing water bowls in a completely separate area, away from the food bowls and away from the litter tray. We have a bowl on the mantelpiece and the cats queue up in a line to drink from it. The thinking here is based on how cats may behave in the wild; either the “peace at the water hole” theory – or, that food found near to a water source could contaminate the water and therefore be unsuitable to drink from. Use a ceramic/glass bowl for water. Plastic bowls can often change the taste of water – as well as harbouring bacteria if there are any scratches or dents on the surface. … but clean water is best – and messy eaters will need their bowls changed sometimes twice per day. Experiment with different shapes and sizes of bowls. Some cats prefer shallow dishes like glass casserole lids, others prefer to drink from something deeper like a cereal bowl – depending on how they use their tongue to lap it up. We have a huge dog bowl because we find the cats’ whiskers get ‘twitchy’ if they’re trying to drink from a smaller bowl and their whiskers hit the sides. Consider offering your cat a glass to drink from. I have a lot of customers who put glasses of water on windowsills (after realising their cats would drink from their bedside tables during the night!). Maybe they like to be able to drink from something more like a deep pool of water. …different types of pet water fountains. There are so many different types available – but the running water can stimulate interest. Make sure to fully empty and wash regularly and replace the filters as these fountains can too often get forgotten and attract insects. Cook them some chicken broth – simply place raw chicken (no salt or added flavourings) in the bottom of a small saucepan, cover with cold water and bring to the boil. Cover and turn down the heat to a simmer. Two chicken breasts will usually cook in about 15-20 minutes – just make sure they’re not pink in the centre. Chicken thighs can be tastier and cheaper – but make sure to never feed your cat cooked bones. Once the chicken is cooked, remove from the pan and slice up as a treat for you or your cat. Once the remaining ‘broth’ has cooled you can serve some to your cat. This can also be a good way of stimulating a poorly cat’s appetite. Switch to a special urinary diet. This could either be wet food with a high moisture content or specially formulated recipe – or dry food that encourages drinking (e.g. Royal Canin Urinary High Dilution). The dry food vs wet food debate is possibly the most contentious amongst cat owners – second to the outdoor/indoor cat question! I’ll come back to the merits of each another time. In relation to cats’ drinking habits a lot of theory is linked to the fact that a cat’s natural prey e.g. a mouse would be roughly 70-80% water. Wet food is usually within that range but dry food is roughly 10%. Dry food has been linked to bladder issues and renal failure because cats can struggle to drink enough water to combat dehydration when on an all dry diet. See if your cats prefer filtered tap water – they may like the taste better, especially if you’re in a hard water area. Lactose free “cat milk” can encourage your cats to drink, and the lactulose it contains can make cats thirsty. Please beware that cat milk can often cause tummy problems, which in turn can lead to dehydration! If you give your cat the occasional treat of tuna, you could also give them a small amount of the ‘tuna water’ (make sure to go for tuna in fresh spring water as opposed to oil or brine) and add water to that. Be careful with ‘human’ tuna as it’s not nutrionally complete for cats and you have to be aware of the mercury levels in their diet. Some cats can become very fussy if they have too much tuna – and start refusing their normal meals! Simply adding a few tablespoons of water to wet food and mixing it in can help. Try putting the bowl on top of a thick book (like the argos catalogue) if elderly cats are struggling to bend down quite so low… or splash out on a fancy feeding station if you’re feeling particularly lavish. Always ask your vet if you’re concerned about your cat’s hydration levels. They’ll be able to advise you on the best course of action – and explain what signs you’d need to watch out for – such as dry/sticky rather than moist gums, or the ‘pinch test’ to measure elasticity. So there we are. Now you’ve tried all of those… you’ll suddenly start worrying, “is my cat drinking too much water?” I told you! It’s the goldilocks principle at work! If you have any more suggestions – I would love to know. Cats That Love Close Ups! Everybody loves a freebie, and I’m really excited to have a summer month of giveaways (UK only) to launch my new cat accessories collection. My day job (and night job… and weekend job!) as a pet sitter means I have a wonderful extended family of fantastic felines who have been happily trying and testing my creations. Every Monday for 3 weeks, there’ll be a new prize to win – announced here – so please feel free to follow our blog (mostly about pet ponderings!) to keep up to date. This week you and your little supercat could be the lucky winners of a Batman bow tie cat collar! The caped crusader’s bow tie is perfect for cats with a bit of POW and comes handily attached to an adjustable black safety cat collar. It’s light weight and full of fun for the summer (full details). We’d love you to share this with all of your furry friends – and maybe some of your fluffy ones too! And of course we hope you’ll send us a picture of our lucky winner wearing their new prize! Please note; The Batman collar giveaway starts at 00:00 GMT on Monday 29th July and closes at 00:00 on Monday 5th August. A winner will be chosen at random through Rafflecopter and notified by e-mail within 48 hours, and mentioned on our blog, facebook and twitter pages. By entering into this competition you are agreeing to sign up to our non-spammy, but very catty e-mail. We’d love you to enter each week. Prizes can only be posted to addresses within the UK (sorry!) and of course if you can’t wait – you can always head straight over to our Etsy shop and have a look at all the lovely things for sale there. Our pesky kitten (Boop) has been with us for three whole weeks now. Checking the dates I’ve realised that we adopted him on the 4th July and re-homed grumpy cat Lyla on 5th November (2009). I think I have a thing for memorable dates (or fireworks?). Generally, it’s been a lovely experience introducing a kitten to our family and can report lots of positive things – something I didn’t expect! Living quarters. Boop reluctantly goes back to his bedroom during the night and when we’re out. We’re almost certain that they’d be okay together alone, but we’re mainly doing it to give Lyla a break. Boop is full of energy (all.of.the.time) and for that reason alone I think Lyla needs to be allowed a bit of time off from babysitting. This also keeps to her strict regime of cuddles first thing in the morning and last thing at night. Boop at three weeks – gaining on Lyla in size! Foooood. For the most part we keep them separate at food times – but only to stop them swapping food bowls. What is it about wanting to eat someone else’s food ey? (I know I drive Mr Whiskers mad eating food from his plate). 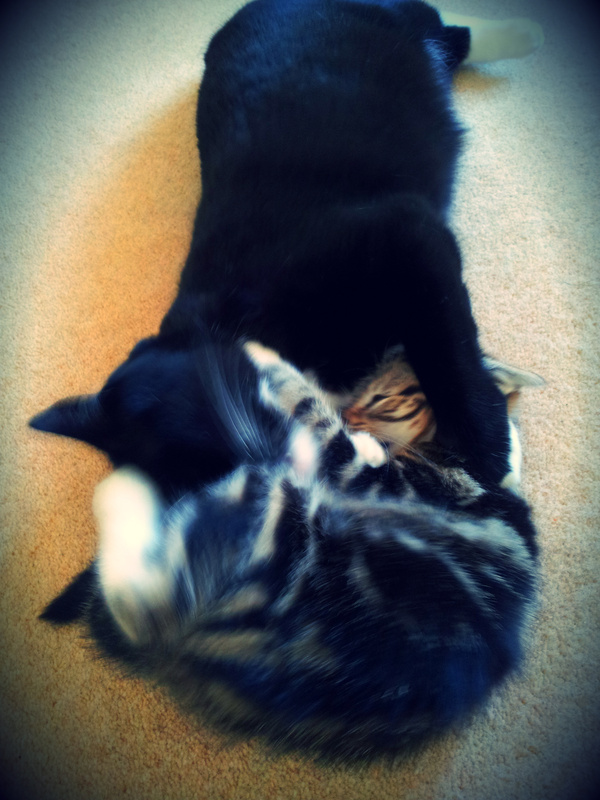 Happily, there’s no fighting at all at meal times but I’m not spending extra money on kitten food for nothing! Personal Hygiene. Boop was quite good at grooming himself to begin with… but has pretty much stopped bothering. This is because he throws himself under Lyla’s feet and bops her in the face until she pins him down and cleans him up. He was pretty smelly before but now he smells like our Lyla. That’s a compliment, of course. Personality. Lyla has changed quite a bit. From a very loud, attention-seeking, super-friendly cat to one that has stopped pestering us every time we blink. Lyla is more playful, more alert and takes much more interest in life e.g. she no longer spends as much time asleep and really doesn’t have the luxury of being bored anymore!… but I do miss her undivided attention. Sometimes she’s a bit huffy, but we always leave the door open so they’re both free to roam – but they almost always stay in the room with us. The best bit is watching Lyla chase Boop out of the room, then after 10 seconds, see Boop chasing Lyla back in. Housework. We’re having to hoover more. With the hot and stuffy weather, Lyla’s losing her glorious winter coat and Boop is eating his way through his kitten toys. The hide and seek games they play include 100 metre sprints around the living room. 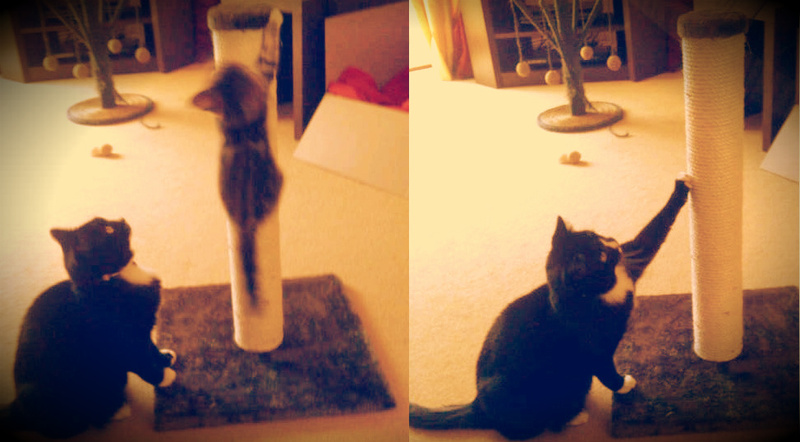 We’re even thinking of having an opening ceremony for the Cat Olympics tomorrow night. Tho we’re afraid Boop would win everything apart from perhaps power lifting and the hammer toss. Our Lyla still has a lot of weight to throw around you see. Cat Olympics? 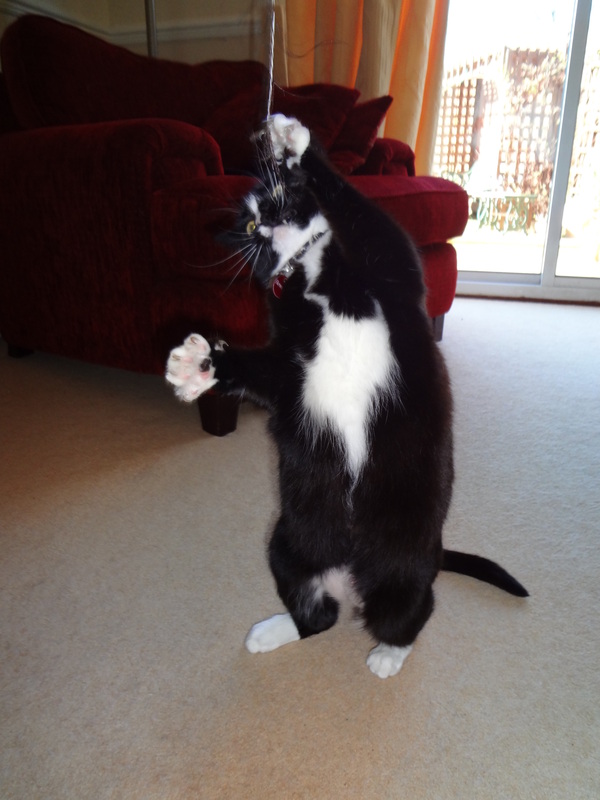 … Poor Lyla – blink and you’ve missed him! Pack mentality. Boop has definitely got a bit more brave. 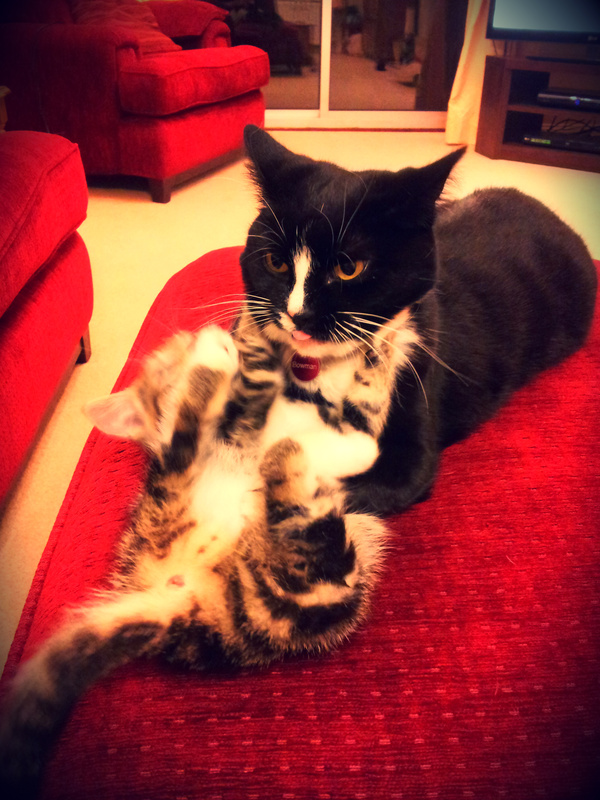 Lyla seems to be using her time to put him in his place – but he just bounces straight back. We’re a bit worried about what happens when he grows past her in size, so when she bops him over the head and pins him down,we’re seeing this as groundwork for future pack pecking order. In theory that is; in reality I’m anxiously sitting on my hands trying to remember that I’m not supposed to interfere. They also both really love Dreamies. 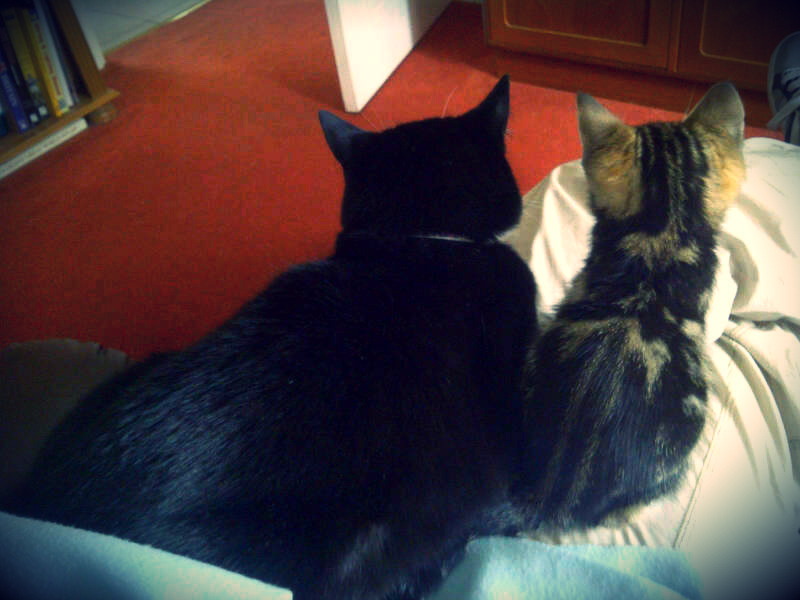 I’m scared I typed it too loudly as both their ears perked up. The sound of the packet opening sends them into a cat-crazed blur. This leaves me wondering what the human equivalent treat is?… For me… this week… fig rolls mmm! Should I let my cat go outside? In the vast internet world there seem to be two groups of cat people; the ‘if you let your cat outside your cat will die’ group and the ‘if you keep your cat indoors then you’re reducing their quality of life and you are bad’ group. It translates as a fight between ‘curiosity killed the cat’ and ‘satisfaction brought it back’. But what about us humpty dumptys? I’ve been sitting on this wall for some time now, but as spring and sunshine have arrived it’s time to do some proper thinking. Animal cruelty. Every day there seems to be something new and horrible out there; the postman-cat killer, cat shot by yobs and the 2010 famous ‘cat in wheelie-bin‘ incident. I’m sure there are more but I’m already thoroughly depressed and the thing is, our Lyla-cat was quite happy in her old garden. It was small and sheltered and she could just about squeeze under the gate to go and waddle about in the cul-de-sac if she wanted to – but most of the time she didn’t. 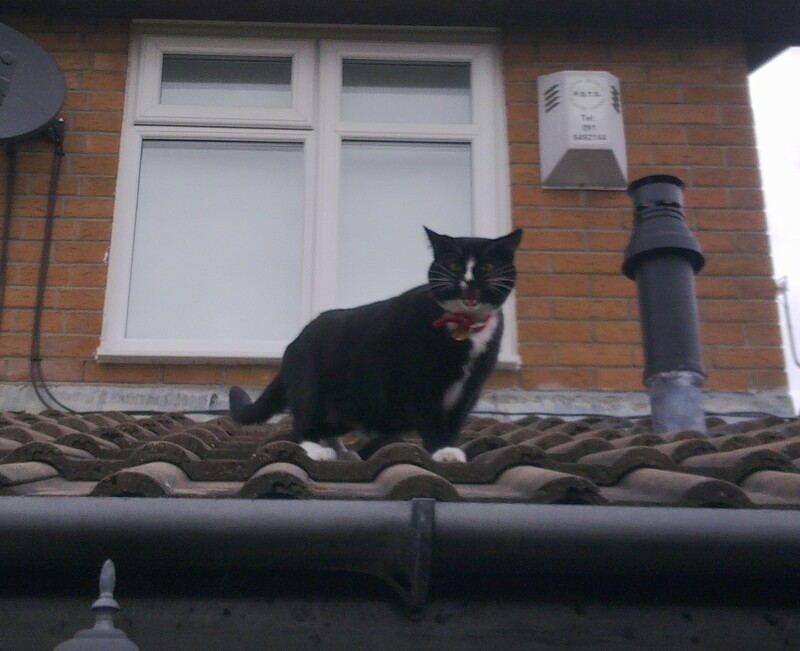 She could climb up the fence and sit on the shed or extension roof if it was sunny – but she’d then have problems climbing back down again (cue angry NOW face). There were a few scary nights waiting up until 2am for her to sheepishly return and worries about the neighbours’ massive moody cat – but in the two years we’ve had her nothing terrible happened. Then we moved at the start of winter and she’s been a happy indoor cat for the past five (admittedly cold and miserable) months and it’s time to figure out what to do! Some sites recommend doing a risk assessment of your new area (e.g. main roads, neighbours, nearby bully cats, cat-flap facilities, nature of cat, groups of evil people etc. etc.) but I’m still sat here twiddling my thumbs. The truth is, I do think it is in a cat’s nature to go outside, be independent and explore their own territory. However, I also know that Lyla-cat isn’t street-savvy, she’s not agile enough to evade evil (people / animals / wizards). I dearly wish she was a rough and ready Thomas O’Malley alley cat able to take care of herself – but she’s not. It would also break my heart if she disappeared one day and didn’t come home. 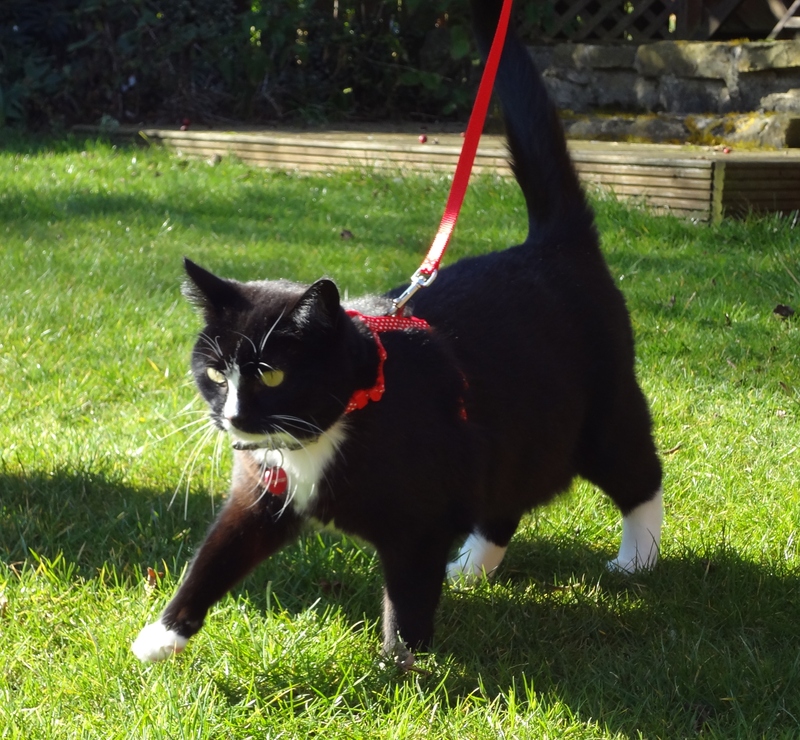 For the past week we’ve been taking her outside daily on her cat harness and lead – which luckily for us she enjoys having on. Walking a cat, is not the same as walking a dog – but she does look cute. See littlebigcat for a very pro-indoor-cat website with some very pro-outdoor-cat commenting!